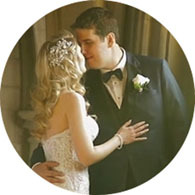 When Natalie and Jim first contacted us about wedding videography, they explained that they initially decided not to hire a videographer to capture their wedding day. But just a month out, they changed their mind. Fortunately we were still available for their October wedding date and they went ahead with booking us. We were excited to learn that their ceremony was going to take place in Hamilton’s Cathedral Basilica of Christ the King! What a magnificent setting for a wedding! Jim and Natalie’s emotions as they exchanged vows and rings during the ceremony were deeply moving, and there weren’t many dry eyes among their guests. Afterward, we tagged along to film their wedding photography session at nearby Princess Point. The Fall colors were stunning! The reception took place at The Cotton Factory in central Hamilton, an old industrial building whose upper floor loft space has been re-purposed for events. The wood floors, the walls, the place is loaded with character and rustic charm! It was absolutely beautiful as you see in their wedding highlights film.